Samsung Smart TVs allows users to easily search for movies, TV shows, browse the web, explore Samsung apps, chat with friends and find many other types of new interactive TV content. Samsung Apps is a growing collection of premium apps specifically built for your TV that connects you to your favorite digital content such as movies from Netflix or Blockbuster, TV shows from Hulu Plus, videos from YouTube, Next Level sports information from ESPN, Music from Pandora, and social updates from Facebook or Twitter. The Samsung LED 8000 series also includes a Full Web Browser to navigate the internet, a Search All feature so you can find videos via apps or other connected devices and a recommendation engine which suggests movies you might like from your Video-On-Demand services. 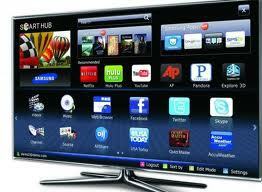 Samsung Smart TVs allow your digital experiences to converge on a brilliant HD screen. Whether you’re watching in 2D or 3D, Samsung Full HD 1080p displays picture quality that’s crisp, clear, and breathtakingly life-like. Users can also convert 2D viewing to 3D, so they can watch sports, TV shows, and all your favorite programming in immersive 3D.